Two theories explain molecular structure: VSEPR theory uses valence shell electron pair repulsion. 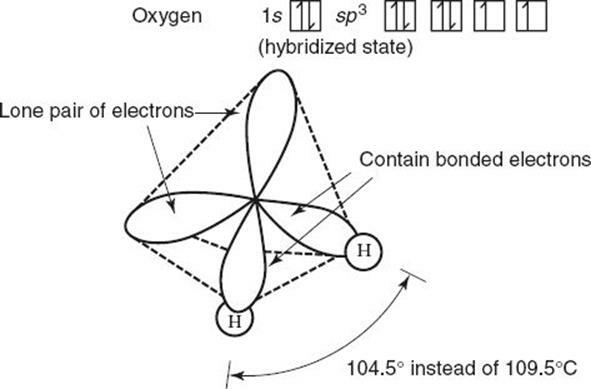 Hybridization theory uses changes in the orbitals of the valence electrons. VSEPR uses as its basis the fact that like charges will orient themselves in such a way as to diminish the repulsion between them. 1. Mutual repulsion of two electron clouds forces them to the opposite sides of a sphere. This is called a linear arrangement. 2. Minimum repulsion between three electron pairs occurs when the pairs are at the vertices of an equilateral triangle inscribed in a sphere. This arrangement is called a trigonal-planar arrangement. These basic arrangements are important to learn! 3. Four electron pairs are farthest apart at the vertices of a tetrahedron inscribed in a sphere. 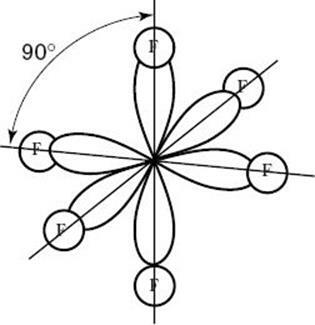 This arrangement is called a tetrahedral-shaped distribution of electron pairs. Configurations often appear as questions on the SAT test. 4. Mutual repulsion of six identical electron clouds directs them to the corners of an inscribed regular octahedron. This is said to have an octahedral arrangement. Ammonia, NH3, and water, H2O, are examples of molecules in which the central atom has both shared and unshared electron pairs. Here is how the VSEPR theory accounts for the geometries of these molecules. 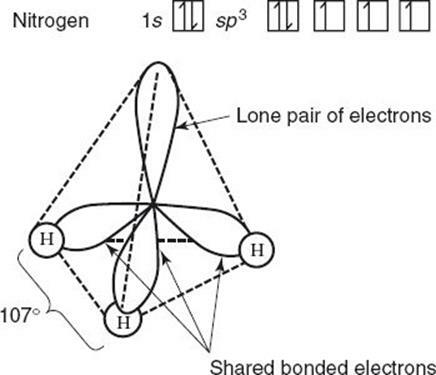 VSEPR theory postulates that the lone pair occupies space around the nitrogen atom just as the bonding pairs do. Thus, as in the methane molecule shown in the preceding section, the electron pairs maximize their separation by assuming the four corners of a tetrahedron. Lone pairs do occupy space, but our description of the observed shape of a molecule refers to the positions of atoms only. Consequently, as shown in the drawing below, the molecular geometry of an ammonia molecule is that of a pyramid with a triangular base. The general VSEPR formula for a molecule such as ammonia (NH3) is AB3E, where A replaces N, B replaces H, and E represents the unshared electron pair. A water molecule has two unshared electron pairs and can be represented as an AB2E2 molecule. 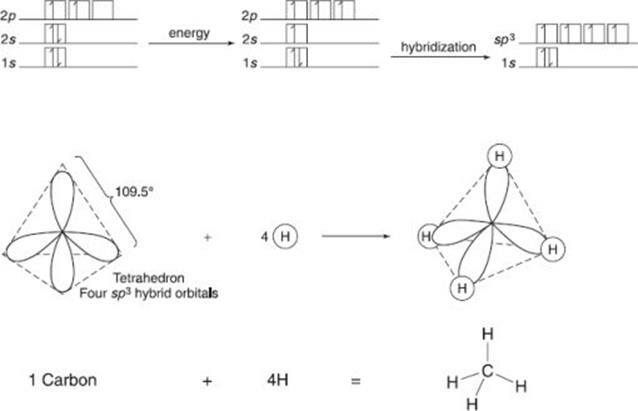 Here, the oxygen atom is at the center of a tetrahedron, with two corners occupied by hydrogen atoms and two by the unshared pairs, as shown below. Again, VSEPR theory states that the lone pairs occupy space around the central atom but that the actual shape of the molecule is determined only by the positions of the atoms. In the case of water, this results in a “bent,” or angular, molecule. The following table summarizes the molecular shapes associated with particular types of molecules. Notice that, in VSEPR theory, double and triple bonds are treated in the same way as single bonds. 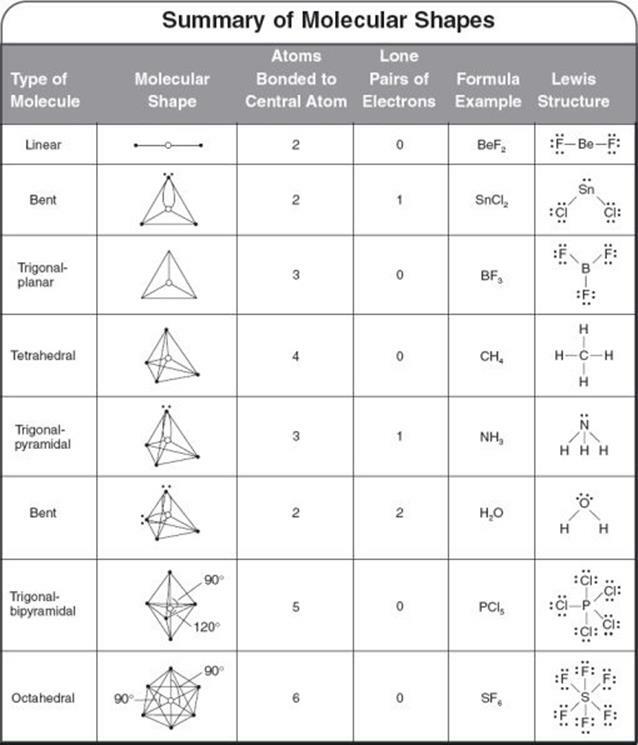 It is helpful to use the Lewis structures and this table together to predict the shapes of molecules with double and triple bonds, as well as the shapes of polyatomic ions. Know these molecular and Lewis structures. Spectroscopic measurements of beryllium fluoride, BeF2, reveal a bond angle of 180° and equal bond lengths. To accommodate the experimental data, we theorize that a 2s electron is excited to a 2p orbital; then the two orbitals hybridize to yield two identical orbitals called sp orbitals. Each contains one electron but is capable of holding two electrons. Methane, CH4, can be used to illustrate this hybridization. Carbon has a ground state of 1s 22s 22p 2. 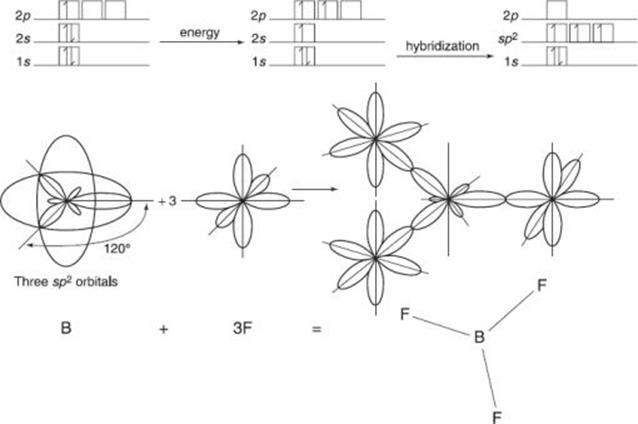 One 2s electron is excited to a 2p orbital, and the four involved orbitals then form four new identical sp 3 orbitals. These orbitals are formed from the hybridization of an s and a p electron promoted to d orbital s and transformed into six equal sp3d2 orbitals. The spatial form is shown below. Sulfur hexafluoride, SF6, illustrates this hybridization. 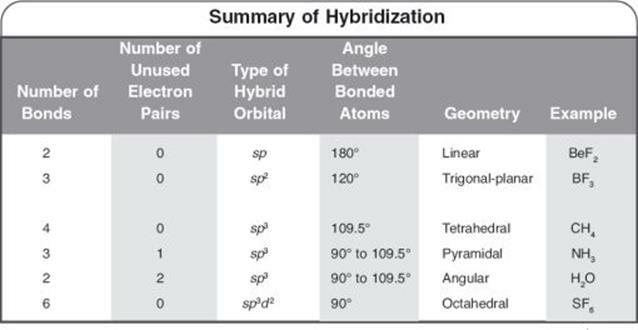 The concept of hybridization is summarized in the accompanying table. 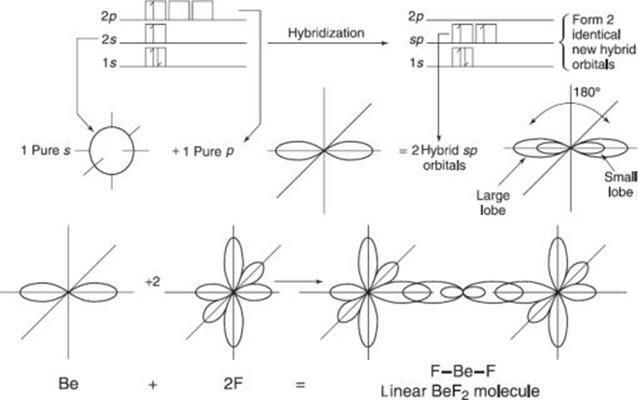 Know these hybrid orbitals designations and their corresponding shapes.